25cc propane gas scooters are just like our famous Bladez scooters, but Bladez stopped making scooters. Luckily for you, we love gas scooters and want you to have the best for a great price. This propane gas scooter has replaced the D-rider line as well as the Bladez line. No more having to mix gas and oil together to power your scooter. The handlebars are specially designed like mountain bikes reducing operator fatigue and discomfort, so you will be comfortable cruising or doing extreme scootering. Drive for up to 40 miles per tank! Perfect method for getting around town and highly reliable. Folds up for easy transport. We are your premier and only source for true propane powered stand up gas scooters. We have all spare parts for these scooters. We send propane powered scooters alll over the USA, and we take care of our customers in Canada too. Outfitted with highly reliable motors. That's right, now you get the reliability of a Japanese engine on your scooter. Lets see our competitors try to do that! Each of these engines is California emissions approved so all of our California customers can enjoy scooters. Take advantage of our slashed prices and no taxes if you order today! Attention scooter fans, take advantage of the super sale while supplies last on propane driven scooters. An amazingly durable gas scooter that is as good as Go-Ped and costs a lot less. Great for use in warehouses, trade shows, and enclosed arenas or areas where gasoline is not allowed. This is one smooth ride for a fantastic price. A very portable means of transportation as it folds down. When you drive and use this scooter you can feel where the quality is and it is very sturdy. Combine great construction with outstanding motors and an awesome scooter is born! Have questions? Feel free to contact us at info@TrendTimes.com. The 25cc propane gas scooters are simply the ultimate anyone can aspire to own in the category of gas scooters. These are the most refined and sophisticated of the family. Equipped with all the other SUPER FEATURES, these are the most stylish and most competitive gas scooters that go green. Performance packages and accessories, (for those who can�t get enough speed), are also available for these series. This gas Power Board is quick, portable and fun. Using a powerful 25cc gas propane scooter engine, this scooter runs along at speeds over 20+ mph. This gas scooter is a fun and exciting way to get from point A to B - faster, farther and cleaner than ever before. 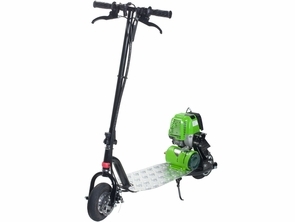 Gas scooters are energy and cost efficient, have cool styling, are lightweight, portable, and the perfect alternative for short trips, local commutes and a variety of sporting and recreational activities. The 25cc gas scooter features real rubber tires, hand activated front disc and rear brake, for a smooth and comfortable ride. Quick release folding mechanism provides compact storage and transportation. Legal Disclaimer: Trend Times.com is not responsible for the use of the gas scooters we sell. Please use them safely as we will not be liable for any injuries that may occur as a result of the use of these products. Children should have adult supervision while riding motorized items. Motorized gas scooters are not toys and require care and maintenance. Due to high demand color choice will be preferenced, but cannot be guaranteed.